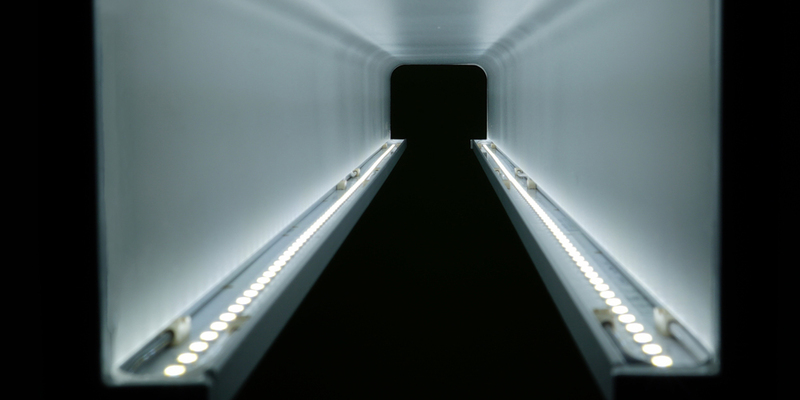 Lumenera Lighting is an architectural linear LED line from RLE Industries, a lighting manufacturer providing quality lighting products made in the United States since 1945. Built from solid aluminum extrusions and powered by the most reputable names in LED board and driver technology, Lumenera products deliver reliably smooth light in well-designed, built to last fixture housings. Products are available in almost any nominal length and fixture runs are customized to project specification to provide steady, continuous light, without light breaks or dark spots. All products utilize 0-10V dimming drivers with reliably stable dimming capabilities down to just 1%. All Lumenera Lighting products provide a five-year warranty from date of invoice. In addition to the Lumenera Lighting brand, RLE Industries continues to offer standard lighting equipment for all projects of every budget and all the metal parts are made in U.S.A. and assembled in our facility in Fairfield NJ. Custom finishes are routinely specified, and many of our designs can be custom made to width, as well as custom made to length. We stock all the materials we need and process them on in house machinery by skilled workers, trained to make sure that all our orders are shipped on time. To schedule a meeting with our team and inspect our facilities contact us at 888-318-0500 to set up an appointment. Please visit our website at www.rleindustries.com for additional information. Welcome to our new website! In recent months, we have retooled our specification submittals and nomenclature, had new product shots taken of our line as well as updated photometry reports and IES files. Ordering information is now included on the submittals and provides an easy to use “box check” method. We thank you for your interest in Lumenera Lighting and look forward to supplying quality fixtures at competitive pricing for your upcoming projects.